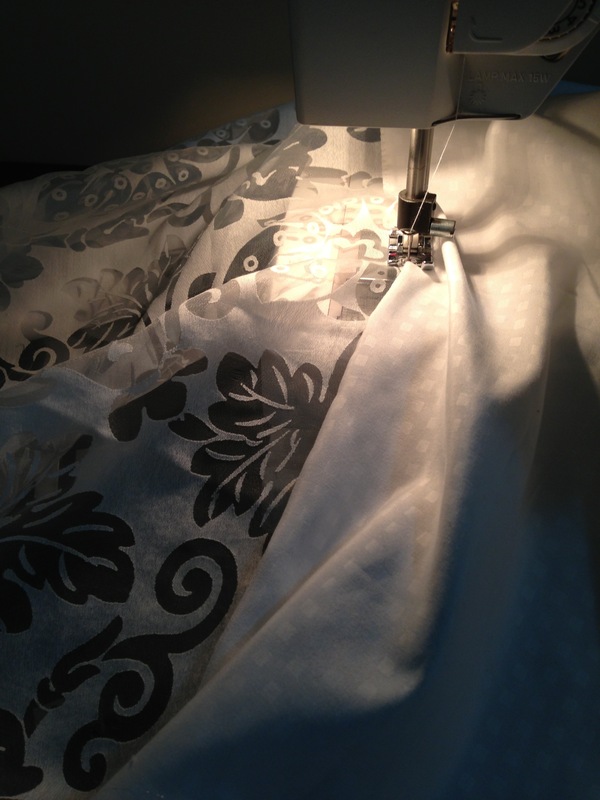 A shower curtain is one of the simplest projects someone can take on when sewing something for the home. They aren’t as large in scale as bedding or even window curtains. And since its the easiest way to change the entire look of a bathroom, why not take a trip to the fabric store and find something snazzy and modern or elegant and chic? I just love the way that a simple curtain can dress up a window, a wall, divide a large room or even hide a closet! My on suite bathroom is unusually small, and originally had shower doors installed. The door track had a collection of mold and mildew that dated back years and I knew that when my baby girl got big enough to bathe in the tub, I was going to have to rip those doors off and install a curtain. Alas, at 8 months old, the day came- and I needed to get creative with how I was going to personalize my bathroom. Now, I could have just purchased a tension rod if I wanted to- but I saw a curved shower curtain rod at Aldi for $20. I purchased one for my second bathroom and it adds so much room to a shower! I had my mind set on that for a long time. I never did get around to buying it, and by the time I had the money to buy something which I didn’t think was a priority at the time, they ran out. They normally cost around $40 at the Home Depot so that was out of the question. I needed to budget myself. Besides, my door comes so close to the tub that I would need to hang the shower curtain high enough to clear the door. I happen to have three regular curtain rods and hardware. That’s right- the most basic ones that you can buy at Ikea. I just have them and I don’t have windows that fit them anymore. So, I decided to put them to good use. Now, I saw an idea for a shower curtain that was framed like a window, with sheers and a valance. I decided to use two of these curtain rods to replicate the look. Only, I immediately ran into a problem: the curtain rods would need to be mounted on the ceiling. My bathroom light fixture hangs direct over the lip of the tub. I would need to hang the curtain rods on either side of the light. Luckily it cleared just fine but my friend ordered a super cool thin LED light that was energy efficient as well as brighter. I believe it cost $18. Bye bye fire hazard. This light is flush with the ceiling. The curtain rods have been hanging for about 2 weeks, and since I haven’t had time to make a curtain they have been hanging there proudly. Basically, the curtain rods straddle the light fixture. I purchased a fabric shower curtain liner from Kmart for $12 a while back and since I had already planned on hanging it from the ceiling I knew it wouldn’t be long enough to reach the tub. My snooty self doesn’t like mildew covered plastic curtain liners sticking to my body when I’m trying to get clean. I decided to put in a horizontal sheer panel to lengthen the liner. I’ve seen them at hotels and I figured it would help let more light into the shower. I decided to use as a curtain, sheers I had hanging else wear temporarily. I hemmed them and modified the liner with the excess to match. The sheers made the liner look polished and elegant. To finish it off, I added a valance. 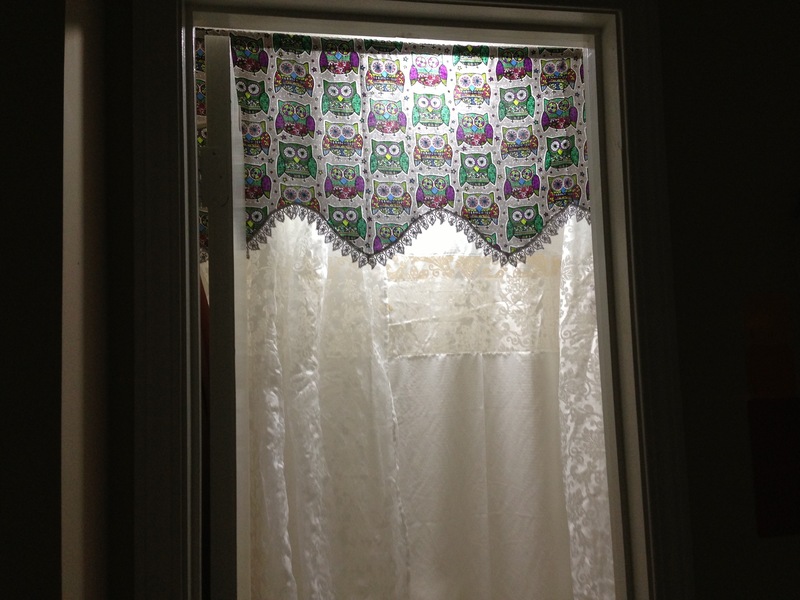 The owl fabric was purchased for $10 at Joann Fabrics. 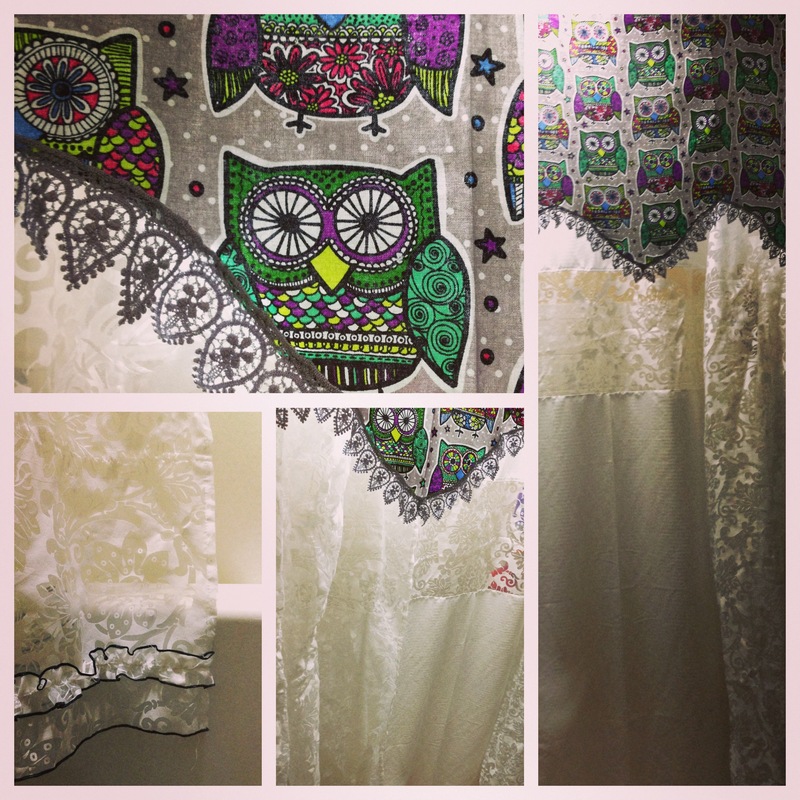 It is one of their exclusive prints for this season. I instantly fell in love with the jewel toned owls and neutral gray background. The polka dots coordinate perfectly with the sheers. I had some trim laying around that was purchased on a supply excursion in Central America. I commend myself for purchasing 4 yards of it when I was there. I still have a little left. 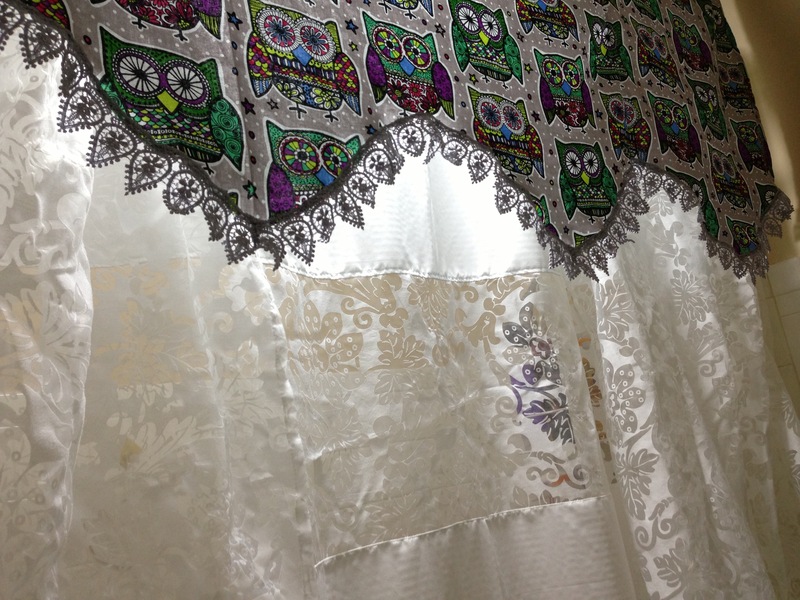 And a bit of the owl fabric. Maybe I’ll make myself a matching knee pillow for when I bathe little Miss.